Value stocks and growth stocks are polar opposites. Value stocks, for example, are like ugly duckling shares. They’re cheap, compared to their respective business earnings. Such companies rarely produce state-of-the art products. That’s why they fly below the radar. In contrast, growth stocks often make investors starry-eyed. They include businesses with high corporate growth. Over the past ten years, growth stocks have soared. These include technology darlings such as Facebook, Amazon, Apple and Alphabet (Google). They’ve increased a lot in price, which is why investors love them. But love and future profits don’t always go hand in hand. The dice are now loaded to favor value stocks. Historically, when popular sectors (like growth stocks) rise year-after-year, their stocks often become expensive compared to their business earnings. In May 2018, the world’s seven largest stocks were all tech companies. They sported a median PE ratio of 43.89 times earnings. Their prices have dropped a bit since then. But they’re still at nosebleed levels. By comparison, the 21 largest holdings in Vanguard’s Russell 1000 Value Index Fund had a median PE ratio of just 21.06 times earnings. That’s why value stocks are now poised to beat growth. You might think value stocks are stodgy. But they perform much better than most people think. Michael O’Higgins’ book, Beating the Dowsang the praises of unsung value stocks. Jeremy Siegel did the same inThe Future For Investors. Warren Buffett also made his fortune picking (mostly) value stocks. And Benjamin Graham’s book, The Intelligent Investor, is still a classic for a reason. Growth stocks enjoy occasional moments in the sun. The past ten years have been a good example. But long-term, it’s value stocks that win. According to portfoliovisualizer.com, U.S. growth stocks averaged a compound annual return of 9.69 percent between 1972 and 2018. That would have turned a $10,000 investment into $774,047. But value stocks did better. Over the same time period, they averaged a compound annual return of 11.05 percent. That would have turned $10,000 into a whopping $1,377,816. Investing with value stocks is like playing with weighted dice. As of early 2019, the same could be said for international shares. Once again, don’t be misled by their recent poor performance. Over the past ten years, U.S. stocks have soared. By comparison, international stocks have sputtered. But over the past ten years, U.S. stock prices have risen far faster than their corporate earnings. That’s why U.S. stocks might face a weak decade ahead. International stocks are now the polar opposite. Over the past ten years, their corporate earnings have increased. But their stocks have lagged. 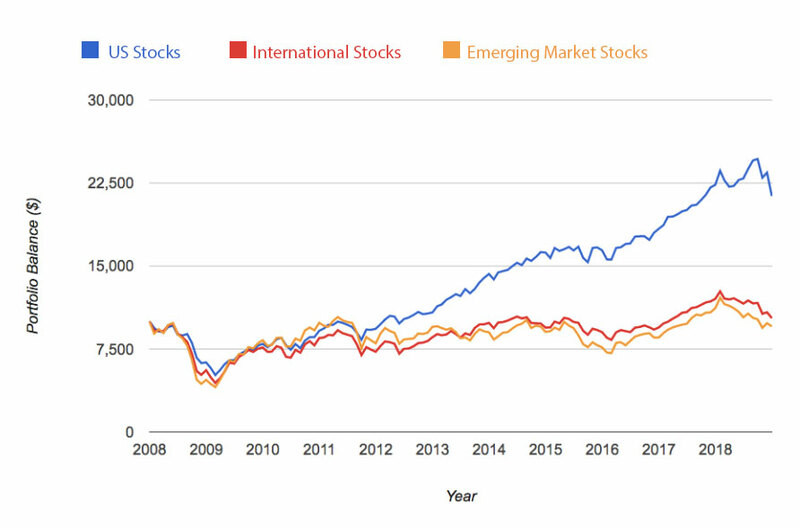 From January 2008 until December 31, 2018, Vanguard’s International and Emerging Markets Indexes averaged compound annual returns of 0.27 percent and -0.42 percent respectively. Such discrepancies between stock prices and business growth, however, never go on forever. That’s why international stocks, like value stocks, are poised to do well. Smart investors shouldn’t shun U.S. shares. Instead, they should always be diversified. But if they want weighted dice, it’s best to shift from the crowd. That means investing in a portfolio of U.S. value stocks, international shares and a bond market index. Such a portfolio might not beat a heavily weighted U.S. growth stock portfolio this year or next. But over the following ten years, history says it should.